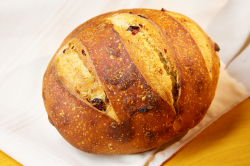 Sourdough Cranberry - Fresh cranberries with a mild sour dough taste make this bread a delight. Ingredients- unbleached unbromated flour, water, cranberries, salt, and wheat germ. 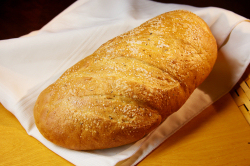 Rustic - A blend of flax and sesame seeds with a sour dough base, crispy crust with a soft chewy center. 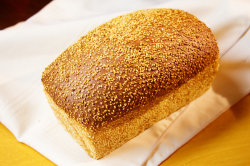 Ingredients- unbleached unbromated flour, water, sesame seeds, flax seeds, salt, and wheat germ. 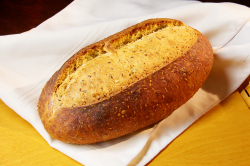 Wholewheat - A nutty tasting Whole Grain bread with cracked wheat and sesame seeds. Ingredients- unbleached unbromated flour, water, whole wheat flour, cracked wheat, powder milk, brown sugar, yeast, and salt. Rosemary Olive Oil - A paper thin crust with a soft interior made with fresh Rosemary. 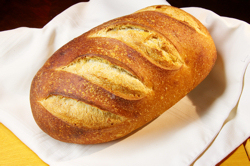 Ingredients-unbleached unbromated flour, water, rosemary, yeast, and salt. Bread is best used in two to three days, otherwise bread should be kept frozen. Follow us on Facebook to receive updates on product giveaways, special promotions, and new products. Copyright© 2007 La Campagne Bakery, All Rights Reserved.